Let’s kick off the first day of the 2019 Downtown Overland Park Farmers Market with a FREE demonstration! 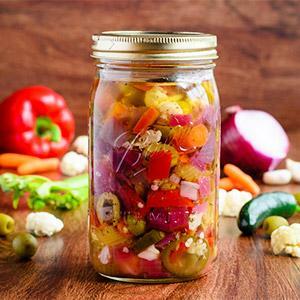 Learn to preserve the bounty of the upcoming season from a quick pickling pro! We’re talkin’ easy-schmeazy pickling lessons that do not use the time-intensive canning techniques. Whether you pick up your gems at a local Farmers Market or you have your own garden, this method of preservation is not just simple and healthy, but could easily be that fun and creative project that you share with kids or friends. Experienced Chef & Instructor Dana Holland is an expert “quick pickler”, and the newest addition to our awesome CCKC instructor lineup. Chef Dana will teach you the art and science of quick pickling. Learn what products can be pickled, how to choose, brining, packing and everything in between. You’ll also get to taste some pickled gems and take away recipes that you can make at home. Now don’t be a picklepuss… Come join in the fun! No need to register - just stop by between 9 a.m. and Noon! Sat 4/20/19 9:00 a.m. - 12:00 p.m.